.....I didn't taste any carrot or especially dog. Why would you add a Pomeranian into the snus mix? They are, in my experience, very yappy little dogs with too much fur. Perhaps they meant to say "Pomegranite? I sure hope so. For me, Moe Unz, it is irrelevant as the lead flavor I tasted was a delicious orange with a background aroma and slight finish of ginger. No dog taste was discernable. Most importantly, there is no mint! Prior, the closest G.4 has come to a mint free snus was FU:ZN which has a tasty apple....with unfortunately, spearmint. Despite the spearmint, G.4 FUZN has been my favorite among the G.4 line. 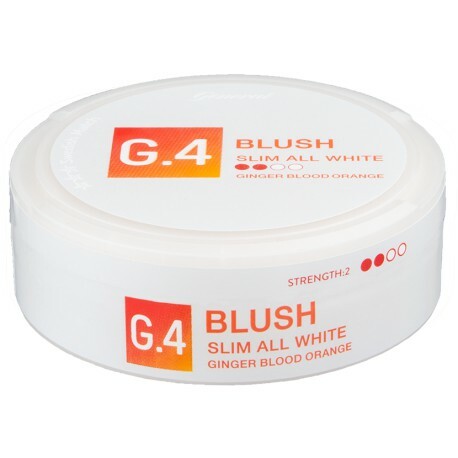 Like all G.4 products, G4 Blush comes in an elongated, all-white portion with an optimized fit that is dry on the surface with moist content for low flow and a lasting flavor release. Mixed in with the fibers used for filler is a small amount of light tobacco. You can't really taste it but it does mean this is not a tobacco-free or nicotine pouch product. The nicotine level is 1.2% which makes it a Strong snus on the low side but you can feel the difference between Blush and the other lower nicotine All White portions. I hope Swedish Match continues making All White/non-mint products in the future. If you are a fan of All White snus, this one is certainly worth a try! Moe's review is spot on with this one! I'll add, it burns like a strong because of the ginger out of the gate and less because of the strength. It's orange, no drip, ginger flavor finish (full circle)... 40 minutes, flipped twice. I like it as much as Cassice and will be ordering this one again. I find this snus to be nice to have just right before bed as I'm unwinding for the day as far as the G4 variety this one I like the best...if you don't like the taste of ginger then it may not be for your preference. But I enjoy a cup of hot ginger tea and this snus right before bed.